Note: This post contains plot details of Annihilation, including the ending of the film. 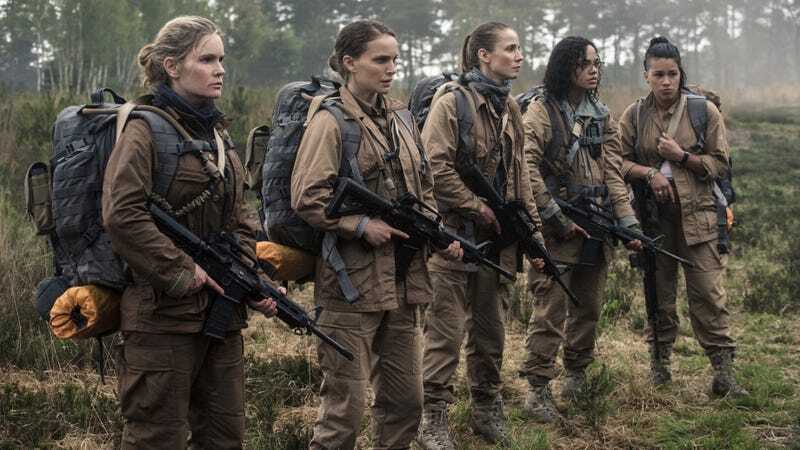 Like most of Annihilation, the ending of the film is left ambiguous. According to a report from Slashfilm, however, an earlier draft of the script from writer/director Alex Garland included a key change to the ending that made things less ambiguous by making them, well, more ambiguous. In the ending that made the final cut, Natalie Portman’s Lena appears to win her battle with the alien doppelgänger she encounters in the weird meteor hole in the lighthouse at the center of the mysterious “Shimmer,” setting it ablaze with a phosphorous grenade. (Between this and The Last Jedi, it’s been a hell of a few months for female sci-fi protagonists climbing into creepy holes and confronting unsettling mirror images of themselves.) This original Lena then escapes the lighthouse to the base at Area X, where she reunites with Oscar Issac’s Kane, who it seems is not the original version of himself. When Kane and Lena embrace, a trace of the Shimmer can be seen in Lena’s eyes, leaving some uncertainty to exactly what version of Lena has made it out. Making it less clear which Lena makes it out of the lighthouse would actually seem to reinforce that it’s not the original Lena, same as it’s not the original Kane. Similar to the two Michael Fassbenders in Alien: Covenant, it’s hard to have a fight scene between two doppelgängers end in an inconclusive manner, and not have the audience immediately expect a switcheroo. By showing the original Lena seeming to escape, the audience is left to fill in the significance of the appearance of the Shimmer in her eyes on its own: Was this Lena still changed by her time in the Shimmer? Is she perhaps affected by her physical contact with Kane? Or—still a possibility—is this not the original Lena that made it out of the lighthouse? Also different in the earlier draft: as Lena and Kane embrace, a meteor shower appears in the background, with one of the meteors breaking open to reveal more Shimmer is on the way to Earth. In addition to lessening the significance and mystery of the Shimmer appearing in Kane and Lena (whether or not the Shimmer is still “alive” is now moot, since plenty more is on the way), this sets up a sequel that, unfortunately, seems extremely unlikely to happen.